Inspired by the photo above, I got to wondering why there was such a drastic change in bottle design in 1915, only to redesign again the next year. Turns out there's a pretty good explanation. But first, some history. As everyone knows (and loves to mention),Coca Cola originally had cocaine in it. A fair amount of it, to be honest. The two main original ingredients were cocaine (from the coca leaf) and caffeine (from the kola nut). Hence, the name. At one point, Coca Cola had approximately 9mg of cocaine per glass. A few searches that ended up with me on the ever-reliable Yahoo! Answers puts that as "enough to notice." Eventually, they started using spent leaves with only trace amounts, and now uses a cocaine-free coca leaf extract prepared in, of course, New Jersey. This is related to the 1915 bottle design, I promise. In the early 20th century, all soda bottles had basically the same shape and were differentiated only by paper labels. Not a big problem, except that the main way to keep bottles cold back then was to drop them all in a big bucket of ice water. Now you've got a bunch of coke-addicted customers bobbing for their daily fix in a vat a freezing cold water. By 1915, after the 4th face-eating incident at a Georgia pharmacy, the leadership at Coca Cola had decided it was time to differentiate. OK, that last part isn't true. The desire for brand recognition, from both Coca Cola and their customers, is true, though. A competition was launched among its bottle suppliers to create "a bottle which a person could recognize even if they felt it in the dark, and so shaped that, even if broken, a person could tell at a glance what it was." 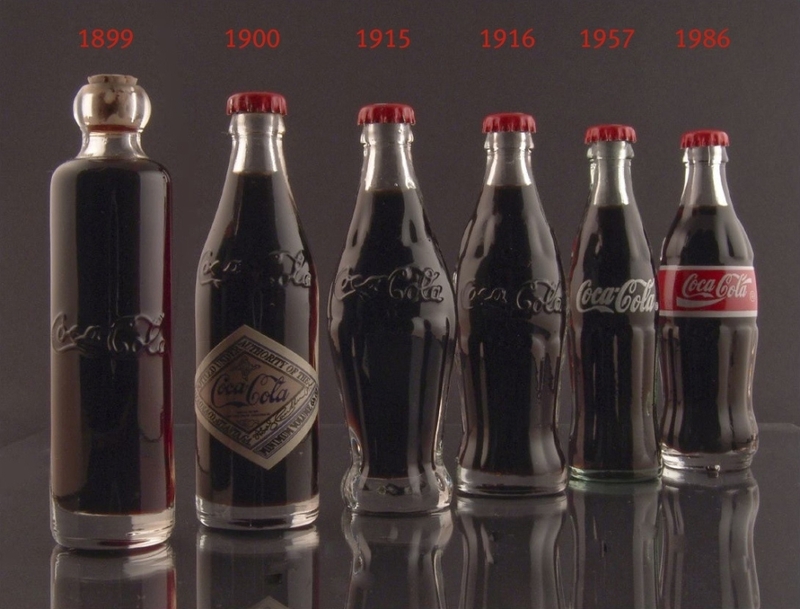 The Root Glass Company of Indiana created the famous Coca‑Cola contoured bottle in 1915. It was designed to help Coca‑Cola stand out from other drinks at the time, and the design brief was to ensure that the bottle was recognisable even in the dark, or if it was broken. Some people think the shape was inspired by a woman's body. Until the 1970s, the official story was apparently that, during a heat wave-induced shutdown at one of Coca Cola's bottle suppliers, the plant superintendent Alex Samuelson (whose name was actually on the patent) was daydreaming designs for the bottle design problem. In a fit of inspiration, he wondered if the bottle shape could be made to resemble either a coca leaf or a kola nut. He sent an employee, Clyde Edwards, to the library to research. Edwards looked up the wrong item and submitted a design that very much resembled a cacao tree seed pod. Chocolate, not cocaine, inspired design. Earl and the auditor found no depiction of coca leaves or kola nuts in the Encyclopedia Britannica. But on Page 628 they spotted a “cocoa” tree branch, bearing pods. The entry says cocoa seeds produce a beverage “fit for the gods.” Those pods caught their attention. Edwards asked Earl if he could design a bottle based on the cocoa pods, and Earl said he could. Root asked Earl if he could beat the deadline. “Well, I’ll do the best I can,” he answered. Root responded, “That’s fine, Earl. That’s fine." In less than two days, Earl R. Dean turned his pencil drawings into a glass model of the planet’s most familiar product. At one point, Earl worked 22 hours straight. He crafted a mold out of a block of cast iron, shaping the two halves with a surface grinder and lathe, and a hammer and chisel. By 11:30 a.m. Wednesday, he and the mold shop crew produced a dozen prototype bottles. Now, as to why that initial design only seemed to last one year. After the prototype was made and the patent was filed, it was discovered that the bottle wouldn't stay upright on conveyor belts given its, ahem, voluptuous shape. Norman reworked it to the now familiar "hobble skirt" shape, the design won the competition during the 1916 bottler's convention, and the Coca Cola bottle got its blindly recognizable shape.